A bird you might miss in the Barrington area unless you know something of its habits and movements is the common nighthawk (Chordeilus minor). Late August and early September is the perfect time frame to become acquainted with this species which, contrary to its name, is not a hawk nor active only at night. Years ago, when our daughter was running in cross country meets on late afternoons in the last weeks of summer, I was as excited by the nighthawks passing overhead as the runners on the race course. On the first of September this year, a friend who lives in Evanston reported seeing hundreds of the birds from his deck. Nighthawks have begun their southward migration, and what a migration it is, both in distance and in character. If you look skyward these days, especially in the late afternoon from just about anywhere, you are apt to see dozens of nighthawks streaming overhead as they head ultimately to South America. Their silhouette might strike you as that of a falcon, with sleek, angled, pointed wings. While they often migrate in large groups, there is no real formation but rather a diffuse, erratic feel to the movement as individual birds seem almost to float at times, deviating from a direct flight pattern to chase airborne insects. If the birds are low enough, you will see the conspicuous white band across the underside of the wings. Though elegant and sleek in flight, the common nighthawk presents an altogether different appearance on terra firma. It is a member of the nightjar family that includes whip-poor-wills, Chuck-wills-widows, and other species that are characterized by large heads and eyes, gaping mouths, bristles around the beak, and intensely cryptic coloration that makes them almost impossible to spot on a tree branch or the ground. All the species in this genus rest in a near horizontal position; they do not perch upright like most birds. Nighthawks have been present all summer, not only in the Barrington area but throughout the United States and into much of Canada. Wholly insectivorous, they are active mostly at dusk and dawn when they hawk insects above town and country. One of my most favorite sounds of summer is the emphatic, nasal peeeent! of nighthawks as sunset nears and they leave their daytime roosts or incubation duties for their aerial insect hunt. But as I think back on this summer, I do not recall hearing or seeing nighthawks on warm evenings as in years past. The first I spotted was a migrant above Baker’s Lake Savanna on the first bird walk of the season August 28th. Since then, I’ve thrilled at the spectacle of nighthawks in migration coursing across the sky above Cook County’s Spring Creek Forest Preserve. 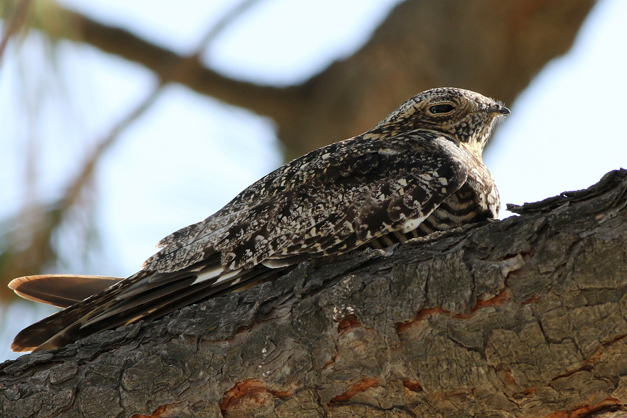 The nesting habits of the common nighthawk are as unusual as its un-birdlike posture. It does not make a nest but rather deposits its two eggs on the ground, on bare soil, gravel, sand, or rock. Its wide range of preferred habitats includes forests, savanna, beach, cities (mostly on gravel rooftops), grasslands. It is often attracted to forests that recently burned. If you have not yet seen a common nighthawk, either this breeding season or ever, now is the time to look for it. Especially as afternoons wane, scan the skies for the buoyant flight of nighthawks on their annual migration from the northern hemisphere all the way to South America where they will spend our winter months before reversing their long flight next spring. And if you’d like to meet Wendy in person, she leads a series of Barrington area bird hikes in the spring and the fall Cosponsored by Audubon Chicago Region and Citizens for Conservation. Walks are free and open to the public though spaces are limited and RSVPs are required. Good walking shoes are strongly recommended for these walks and don’t forget your binoculars!